Just about every cell in your body contains microscopic organelles called cilia. Primary cilia act like antennas, detecting and relaying molecular signals from a cell's external environment. 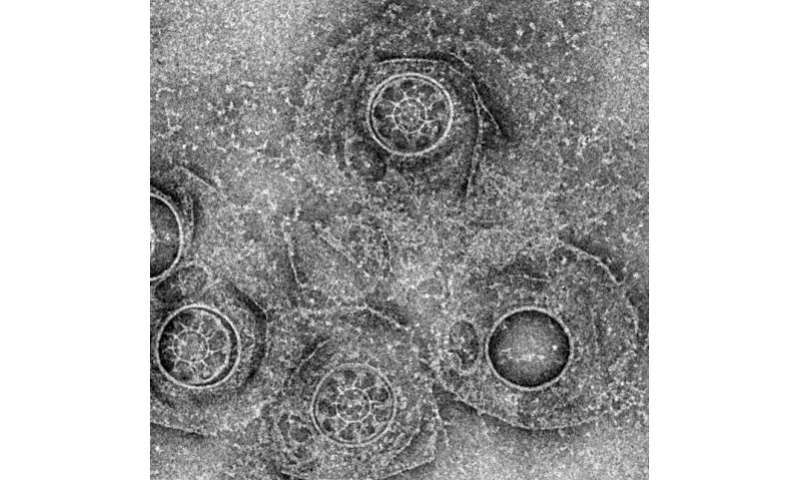 Motile cilia paddle together in a single direction, like oars on a rowboat, either moving a cell along or regulating the flow of fluids around the cell. Properly functioning cilia are critical to good health. For cilia to function properly, however, the hundreds of proteins that comprise them must be appropriately partitioned and compartmentalized. How this process is carried out is largely unknown – but scientists have now taken a significant step towards understanding the process. A team of Berkeley Lab and UC San Francisco researchers have identified a structure at the base of motile cilia that appears to have all the features required for cilium partitioning and compartmentalization. They have dubbed this structure the "ciliary partitioning system," and it might one day provide a prime target for pharmaceutical ciliopathic therapies. "This is the first identification or certainly the first isolation of a physical structure that could serve as the partitioning system for cilia," says Ken Downing, a biophysicist with Berkeley Lab's Life Sciences Division who led this research. "While many suspected that such a system existed, nobody had found it nor seemed to have much of an idea as to how it might work." A cilium is essentially a filament made up of a unique organization of microtubules, called an "axoneme," that is sheathed within a membrane and anchored in the cell by another organelle called the "basal body." Using electron microscopy and working with Tetrahymena pyriformis, a hairy teardrop-shaped microbe often used as a model organism in studies of cilia, Downing and his colleagues found a plate-shaped structure at the ciliary base that potentially serves as a cytosolic "ciliary pore complex." Featuring nine pores through which the microtubules pass, this complex forms tunnels for the movement of proteins from the cytoplasm of the cell into the cilia. The researchers also found a detergent-resistant membrane region well-suited to serve as a diffusion barrier, plus a ring complex that connects the ciliary pore complex to the membrane diffusion barrier. "Our proteomics analyses show involvement of the membrane domain in vesicle trafficking, suggesting that this region plays an active role in membrane transport," Downing says. "The ciliary pore complex and the ring together form a complete partition defining the ciliary boundary." Downing and his colleagues have published a paper on this research in the journal Current Biology titled "Architectural Insights into a Ciliary Partition." Co-authors were Puey Ounjai, Keunhwan Kim, Haichuan Liu, Ming Dong, Andrew Tauscher and Ewa Witkowska.